The housing woes of millennials are certainly no secret. In today’s climate, in which many young people feel that owning their own home is out of reach, it has been said that huge numbers lack both the financial confidence and instrumental life skills to take up the challenge. A recent study by Aviva harshly condemned millennials as ‘generation hopeless’ – citing it as evidence they too often aren’t able to do simple tasks around the home, like change a lightbulb or boil an egg. It also claimed many haven’t yet learned to save money and manage their spending, far ruling out the responsibilities that come with getting on the property ladder. Our property experts at Strata however believe it’s unfair to tar every millennial with the same brush and have conducted extensive research to prove that millennials are in fact learning key life lessons by living at home for longer. The answer lies closer to home than you might think. Multi-gen (multi-generational) households are an increasingly popular idea. Once the done-thing, it’s a way of life that seemed to disappear decades ago when getting on the property ladder became easy and straightforward. Now it’s not so, the concept had seen a re-emergence. In a multi-gen living arrangement, two or three generations of the same family buy, or move back into, a large family home that they’ll share together. This could include any combination of grown up children, their partners, their parents, aunts and uncles and even grandparents. There may even be space saved for when adult sons and daughters have kids of their own. Rather than going it alone and renting elsewhere, many people are heading back to their parents’ house when they finish university. The Office for National Statistics reported a 46% increase in the number of people living in households like this between 2005 and 2011. It’d be a reasonable assumption to suggest the boost in popularity for this style of living is born out of necessity. In a survey we undertook, seven in ten British Millennials who weren’t ready to move out said that the reason they weren’t was because they can’t afford a property of their own, and one in five admitted they didn’t even feel they were responsible enough with money to give it a go yet. It isn’t just about finances. As many as 21% stated the reason they didn’t want to leave the family home was because they lacked the household skills their parents and grandparents have. A quarter of those who had gone ahead and left said this had been a problem for them. Overall, 57% of 18-24 year olds still living in the family home just don’t feel ready to go. It is however, easy to make a virtue of necessity. 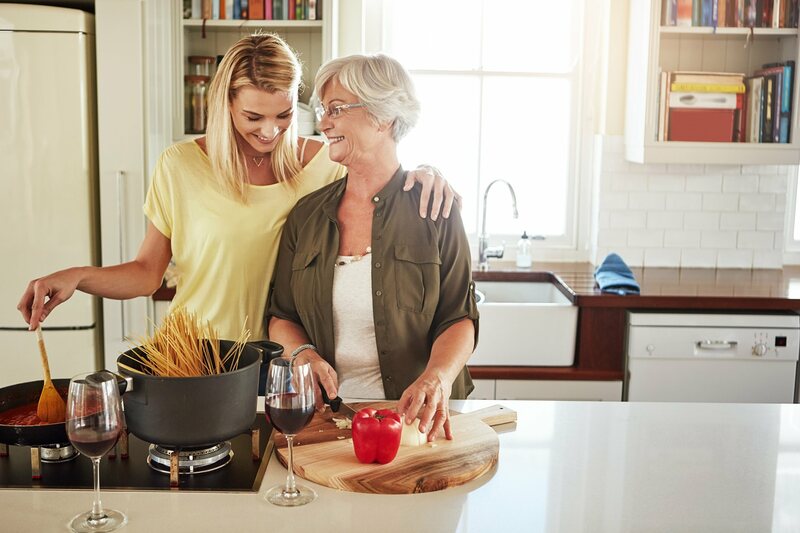 While many multi-gen living arrangements often arise as a necessity, there’s a whole host of benefits to sharing a home with members of your extended family. Living with parents and grandparents is a great way for young adults to save money. Rather than paying rent, bills and council tax alone each month – they can come to a payment agreement within the multi-generational household that will undoubtedly be far cheaper than going it alone. Over the course of a few years, these savings could amount to thousands – even tens of thousands – easily covering the cost of a deposit on a home of their own. This allows them to leapfrog the costly ‘rental’ period many battle through to get onto the property ladder. It’s not just the youngest who can save though. The older generation(s) in the home-share can make modest savings. Over the course of each year this may well amount to the cost of holiday or home renovations. A multi-gen living situation is a great opportunity for youngsters to learn about managing their money. It means they can take gradual steps, slowly gaining responsibilities without feeling overwhelmed. It also ensures that they won’t have to worry too much if they make mistakes, and they can grow and learn without the threat of court action or eviction if they don’t manage so well at first. 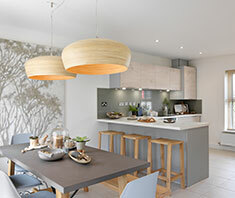 79% of Brits agreed knowing how to handle finances is a necessity when it comes to living alone, and with half of us agreeing our parents’ and grandparents’ generation valued frugality more than our own; it seems home may be the best place to learn. By coming together to buy a new home, the money pot will be larger, and you may be able to find a home that has more space, features or a location you couldn’t afford if you all went it alone. Perhaps you’ll get the garden you always wanted, or a spot in the market town of your dreams. Living together also offers financial protection. If one member of the family loses their job or becomes too ill to work for example; the other contributors can help take care of financial responsibilities, and lessen any immediate impacts. If you’re even considering moving in with children, parents or grandparents – you probably get along well. Things won’t always go perfectly, but overall you’ll find living together a fun, happy and enriching experience. With our survey finding a lack of life skills to be a top concern of theirs, millennials could learn plenty from their elders in a multi-gen home situation. Our survey found that 72% of the public agreed that their parents and grandparents valued skills such as cooking and preparing meals more so than their own generation, and over half of people thought the same for household chores. Meanwhile, 63% of British adults today felt they’d learned their cooking skills from family members, and the same number said that’s where they’d developed their sense of respect. Almost three in five agreed they had developed cleaning skills from parents and grandparents. All of this suggests the family home is by far the best place for young adults to learn these vital life skills. Developing these all-important abilities in a multi-gen home means they can learn, step-by-step, in an environment where they feel comfortable. Family are on hand to provide advice and support when it comes to any recipe or chore, meaning they’ll learn much quicker than they would do by trial and error on their own. When they eventually move to a place of their own, they’ll be well prepared. As much as younger family members have to learn from their elders, there’s plenty parents and grandparents can learn from their millennial descendants too. The world’s changing fast and there will always be some things the young have adapted to quicker to than the old. With a millennial around, nobody will have to panic about what to do if the WiFi goes down, or wonder how to use the voice command feature on the new TV. Our survey revealed that almost two in five British parents admitted they had discovered how to keep up to date with modern technology and use the internet via their children. A similar number told us it was their kids who’d told them all they need to know about social media. This was particularly true of mothers, with around half agreeing their sons and daughters helped keep them up to date. It’s a sad and unfortunate truth that many older people suffer loneliness, and feel isolated and forgotten during periods of ill health. By bringing ageing parents or grandparents into a multi-gen living situation, it ensures they’ll always feel loved and looked after, with the other household members able to keep an eye on them. To make your multi-gen living arrangement work, it’s important you find a home, financial arrangement and set of ground rules that suits everyone. You may already have your family home; and your multi-gen living situation is simply a case of inviting others back in. But if you’re buying your multi-gen home from scratch, it’s important to take everyone’s views and requests into account. It’s impossible to please everybody 100%, so work together to find a comfortable compromise. Consider how many rooms you will need. How realistic is it you’ll find a property that fits everyone in? Even then, are communal spaces big enough? And then you’ll need to consider how feasible all of this is. Are properties of the size you require likely to be in budget in your chosen area? It might be worth looking elsewhere. Maybe you don’t need such a big garden if there’s a nice park nearby, for example. It’s compromise that really will be key in finding a solution, and a home, that works for all involved. To do this you may need to reflect on the availability of larger properties in your chosen area. How many, five, six, perhaps even seven bedroom properties are there locally? The table below shows the numbers of properties in popular areas – by number of bedrooms – that are currently listed on Right Move (July 2017). 1. Parents own the home and pay the mortgage. Their children pay a lump sum ‘rent’ to cover their living costs and share of the bills/taxes. It’s important to make this ‘rent’ amount reasonable, to keep the arrangement favourable compared with renting alone. 2. Parents own the home and pay the mortgage. Their children cover the bills, taxes and food shops. This situation encourages the household’s younger members to take on responsibility- understanding they’re in charge of keeping the lights on, the WiFi working and everyone fed. 3. Parents and their children are named together on the mortgage and split the cost. Bills and taxes are divided along ‘fair’ lines. This scenario allows millennials to gain the skills and responsibility that comes with home ownership, without having to go it alone and learn the hard way. The parents will be around to cover any financial shortfalls in an emergency. 1. Parents own the home and pay the mortgage. Children pay a ‘rent’ figure to help cover the costs of their being there, while grandparents take responsibility for bills and food shops. 2. Parents or grandparents own the home and pay the mortgage directly, while the other members of the house contribute a ‘rent’ sum to help cover it. Bills, taxes and food costs are divided equally between each person. 3. Parents and children co-own the home and both pay the mortgage, giving the younger family members vital home-ownership experience in a controlled environment. Grandparents contribute wherever they can regarding bills, taxes and household goods. Respect private space. In a multi-gen home, communal areas will often be a hive of activity, so everyone will appreciate having their own space to withdraw to. If you’re all adults, don’t enter other people’s spaces without permission or good reason. Be flexible. Each generation will have different lifestyles. It’s important to consider what is reasonable in the wider scheme of things, and not just through the eyes of your own age group. A younger member of the household sharing drinks with friends at home on a Saturday evening isn’t unreasonable. If it’s still going on in the early hours – it clearly is. Establish who owes what. Everyone should know what their responsibilities are, and every effort should be made for these to be met. Be reasonable if they’re not, particularly towards youngsters who’re learning, but stand firm on them. Designate chores. Everyone needs to contribute to the day to day running of the house. It’s clearly unfair if some members are sat with their feet up while others are cleaning. Either you can get strict about it and agree a rota, designating particular jobs – or take a more relaxed task-by-task approach. Be diplomatic. If you have a problem, raise it in a reasonable manner. Consider calling a household meeting if there’s an issue that really needs discussing. While the increasingly popular trend of multi-gen living may be born out of necessity, it’s a scenario that can so easily work for all involved – teaching one another, providing support and enriching each other’s lives. 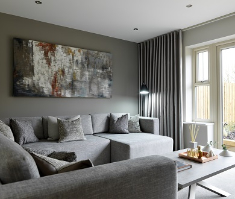 Our collection of new homes at the Opulence Whetstone development features 4 and 5 bedroom homes that are ideal for a growing multi-generation family. 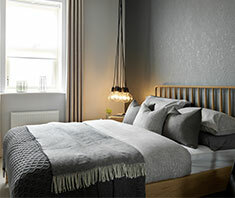 The Copenhagen features four luxury bedrooms; two doubles, a single and the master luxury ensuite, and an open-plan kitchen dining area with a snug and separate living room. In addition, there is a cloakroom, utility room and a separate garage. The Valencia has been designed with a double height entrance hall which leads to a lounge with large bay window. The kitchen, dining and family area at the back of the home has French doors opening onto the garden. Upstairs, five bedrooms lead off an open central landing, with both the master and second double bedroom featuring private ensuite.